Florida Gov. 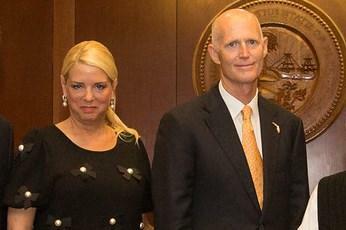 Rick Scott and Attorney General Pam Bondi are going to speak at the Republican National Convention. Convention organizers on Thursday released a partial list of speakers that shows the two Florida politicians will appear on stage at next week's event in Cleveland. Bondi was the first high-profile Florida politician to back presumptive GOP nominee Donald Trump ahead of the March primary. Scott didn't endorse Trump until after the primary. Other well-known Florida Republicans including former Gov. Jeb Bush and U.S. Sen. Marco Rubio are skipping the convention. Bondi is getting a speaking spot despite questions that have been raised about her connections to Trump. She personally asked Trump for a contribution to a political committee around the same time her office was being asked about a New York investigation of alleged fraud at Trump University.